I had my first pen pal at the age of 16, and over 8 years later, I’m still writing letters to those friends and making new memories with new friends from all over the world. If you’re looking to connect with people and become friends through snail mail (or even through e-mail at times) then having a pen pal is right for you. You can share your travel photos and make your travel map to find new pen pals from different places in the world. Start talking to your new friend through their website. A good match? Then exchange addresses and start writing and making new pen pals! They have this cool “Quick Search” that helps you find someone based on age range and nationality; and same goes to you, provide them with just your name, age , language and nationality so others can find you. Couchsurfing wasn’t made specifically to find a pen-pal, however, there’s a forum called “Pen-Pals” in which people from all over the world can post a thread, pretty much specifying that they’re looking for a pen-pal between certain ages and nationalities, and sometimes a reason why. (Someone from France is looking for friends in the States or England, because he or she is learning English and would like to practice). this is where I found my first pen-pal from England, Saudi-Arabia and Trinidad. Send and receive real postcards from anywhere in the world. The guys at Post Crossing don’t acknowledge it, but using their service may give you a great opportunity to make friends with *two* people that are completely random, and worst case scenario, you received a cool postcard! 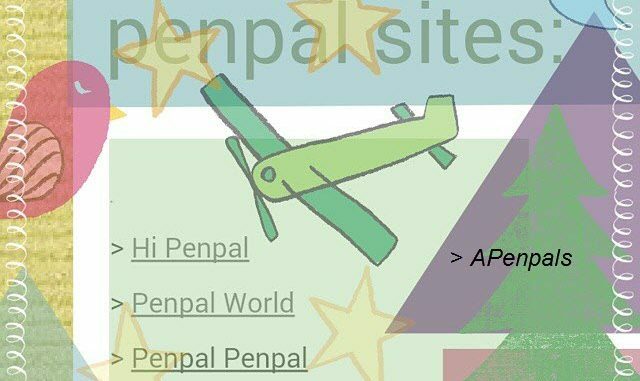 Find pen pals based on gender and age. Find the gender and age group of your preferred pen-pal and go through the list. You’ll see their email, where they are from and a brief description. You can search for pen-pals based on age, gender and where they are from. Also, you can choose to be part of their directory or not. It might be worth it just to check it out, you know (for all you single people out there…), the webmaster says he fell in love with his wife through letters! This website is pretty simple and it categorizes your pen-pals in simple groups, such as, “kids,” “teens,” “moms,” “dads,” “college,” etc.